Brewers at Beau’s All Natural brought an early spring to Eastern Ontario this year, brewing up its spring seasonal IPA, Beaver River, a month earlier than usual. The strong, hoppy ale will be available beginning this Thursday, Feb 2 at the LCBO, Beau’s retail store, and for home delivery in Ottawa through the BYBO service (www.bybo.ca). Hoppy and delicious, Beaver River marries the typical flavour profiles of the British and American interpretations of an India Pale Ale. Expect a bold yet balanced presentation of hop bitterness, bready malts, fruity esters, and a blend of both citrusy and earthy aroma hops. 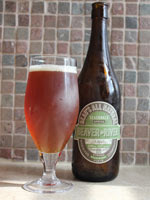 Beaver River was a Gold medal winner at the 2011 Canadian Brewing Awards, where it was selected as the best IPA nationwide. Beau’s will celebrate the return of Beaver River with a cask tapping at noon, Saturday February 4 at the brewery, and an informal “meet the brewers” session from 12-2 pm. Home brewers, beer enthusiasts and the curious are invited to come by to try this year’s version of Beaver River. Tours and tastings will also be going on, and the first 100 visitors to the brewery will receive a Beaver River collectors’ poster. In addition to onsite celebrations for Beau’s new seasonal beer, Vankleek Hill’s winter carnival is also taking place on Saturday, featuring an all day hockey tournament at the arena, kids’ games from 1-3, bed races at 3 pm, a chili supper from 4-6:30, and an old fashioned evening skating party from 6:30 to 8:30. The launch of Beaver River is also the beginning of FeBREWary for Beau’s All Natural Brewing, a month of celebrating great beer and collaborations with like-minded people. The brewery will release 5 beers in 4 weeks, as well as host numerous beer events each weekend of the month, in Vankleek Hill, Ottawa, and Toronto. A schedule of FeBREWary beers and events is available at www.beaus.ca. Sales of Beaver River begin at 10 am on Thursday, February 2 (Groundhog’s Day). The beer will be available in 1.89 L growlers through the brewery and online, in 600 ml bottles at the LCBO, and on tap at select restaurants in pubs in Ontario until May. The 600 ml bottles will retail for $4.35 at an ever-growing list of LCBO outlets across Ontario.